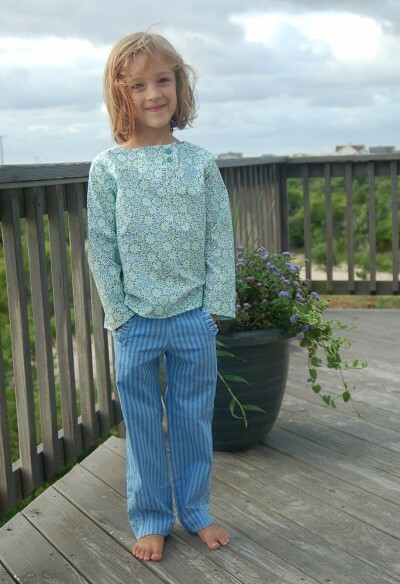 We’ve done a lot of patterns for dresses over the years, but not a lot of pants for girls. I was thinking specifically of the girls when I designed this style, but some of you have correctly pointed out that it can work for the boys as well. So don’t let me stop you. I think you’re right! The shirt is a pull-on style with asymmetrical buttons at the front and back. This is a loose-fitting silhouette with long sleeves and a little bit of flare in the shaping, just for the fun of it. You could have a lot of fun with the yoke here, using a contrast fabric, adding piping or trim to the yoke seam, or playing with contrast topstitching. And of course you can always play with the buttons themselves and select something unique or exciting for a little added interest. In the first photo below, I chose green buttons to coordinate with the green in this print. In the second photo I chose yellow buttons to highlight the bits of yellow in the print. Both prints are from our Cape Ann collection, which will be in stores this October. 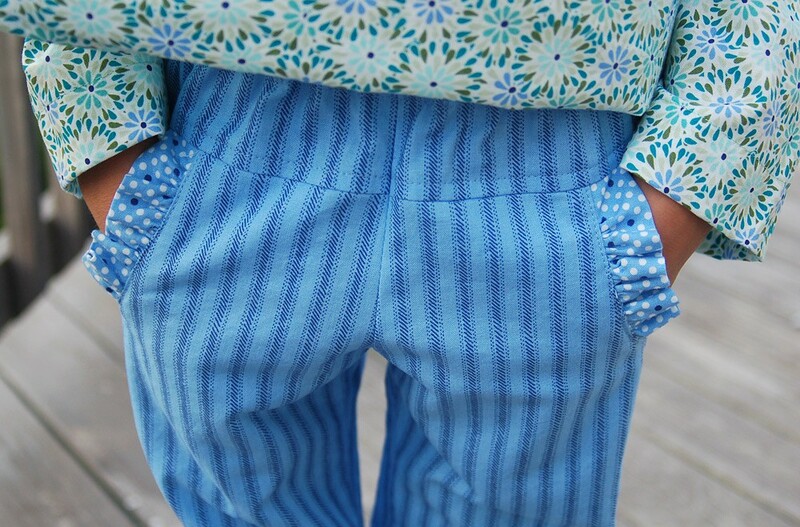 The pants are rather unique and allow for lots of customization. I really can’t wait to see what you do with this pattern because I think you’ll find all sort of ways to play with it. The pattern includes a separate side panel with a lower piece near the hem that is designed to be cut from a second fabric–a contrast or complimentary print, perhaps. 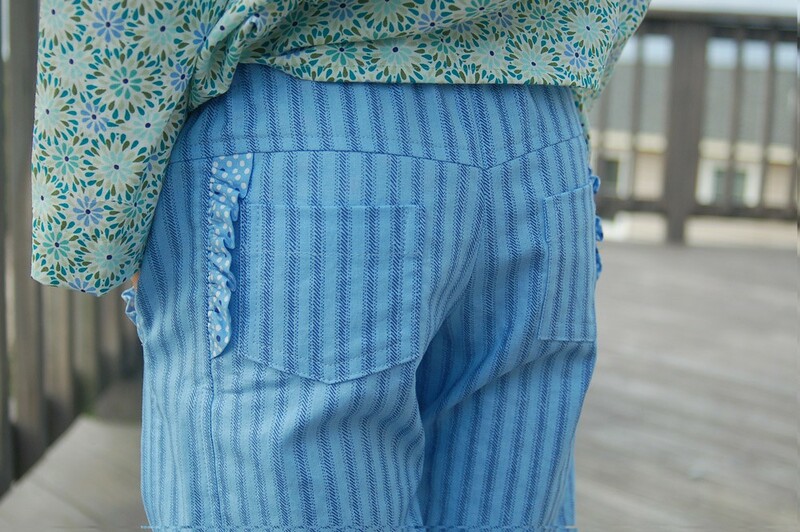 The pants have front and back pockets, a shaped yoke that makes a little “V” in the back (somewhat reminiscent of blue jeans) and an elasticized waistband. Easy to sew, but with lots of great details that I think you’ll enjoy customizing. 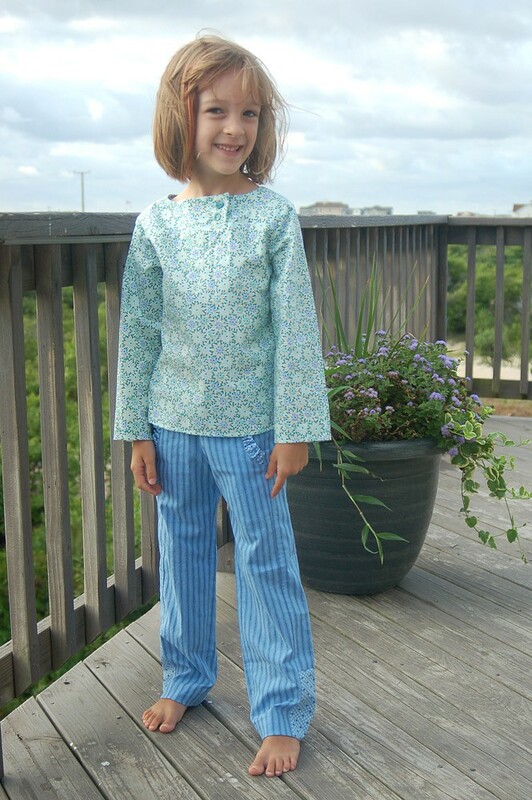 Building on the subtle ruffle theme of our fall patterns, View B (which is shown in all the photos in this post) includes the little ruffles on the front pockets and along the side panel at the back. They’re cute and girly without being too frilly or over-the-top. But if you’d rather make them without the ruffles, View A is the version for you. I’d love to see some piping on these pants, or some color blocking (maybe a different color for the entire side panel?). Like I said, I think you’re going to have a lot of fun with this pattern. This pattern will be available on our website and at Oliver + S retailers worldwide beginning the first full week of September. I am so very excited for this pattern!! My youngest is at the larger end of O+S size range and I think these pieces will work up beautifully for her. And in the newest fabric range…..Wow!! Once again, Liesl, you have hit it out of the park!! I love all your patterns! and one day I will splurge and buy one! I love that it is long sleeve. There are not many patterns with that feature. 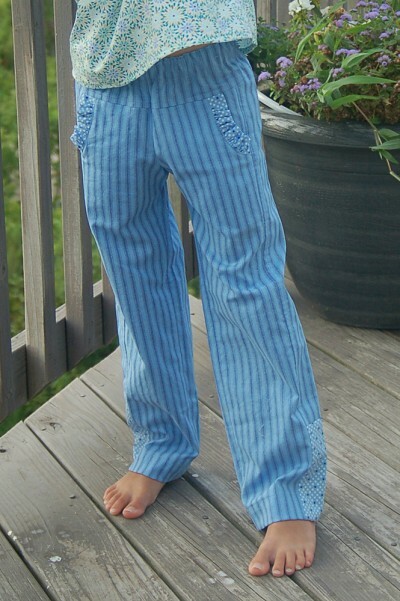 I really love the pants, I think that they will perfectly fit my daughter. 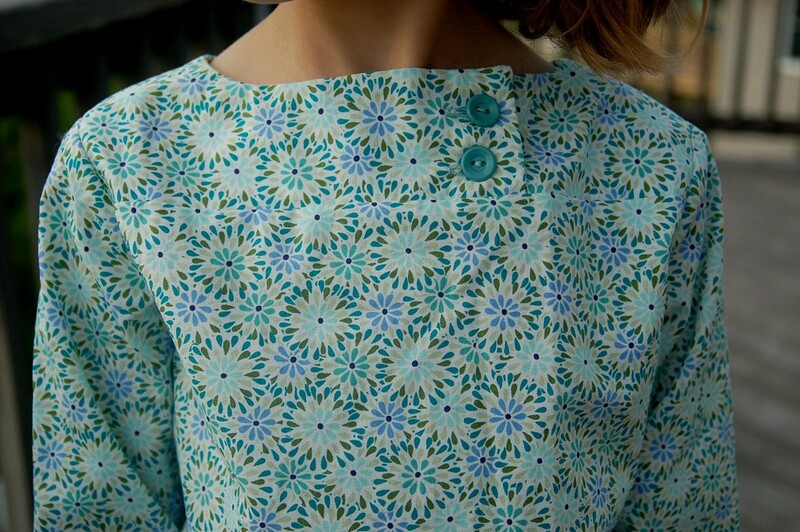 The design and all the details are so great, I can’t wait to try this pattern! The shirt is really nice too!